John Allen is a Past Master of the Worshipful Company of Fan Makers and has been a member of the Livery since 1971. He is currently almoner for the Company and chairman of its Court Selection Committee. He was educated at Epsom College and Portsmouth University, where he obtained an honours degree in policing sciences. He served with the Metropolitan Police for 30 years, latterly within their Royalty Protection Department at Buckingham Palace, and retired in the rank of Chief Inspector. Between 1998 and 2000 he served as personal assistant to Sir Richard Scott, Vice-Chancellor of the Supreme Court. He was appointed Clerk to the Worshipful Company of Cutlers in 2001 and remained there until 2013. He was then appointed Clerk to the Worshipful Company of Gunmakers. 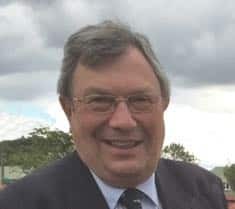 He served as a Council member of St John Ambulance, London District between 1999 and 2001, and was chairman of the Livery Companies’ Clerks’ Association in 2011. He is married to Susan, and they have a son and daughter.